AS IT STANDS: The Interview: Is There A Light At The End Of The Tunnel? The Interview: Is There A Light At The End Of The Tunnel? Is the Russia/Trump investigation coming to an end soon? Mueller's request for an interview with Trump has some experts saying it sounds like the natural progression of an investigation. Apparently, it's normal to talk with the main player last. Let us not forget however, there's nothing normal about this investigation into Trump's, and his campaign staffs, coordination and obstruction of justice. Trump's outside legal team is trying to avoid a face-to-face interview between Trump and Mueller. For good reason. If Donny has to sit down more than fifteen minutes and defend himself to Mueller, he's going to come unglued. His lawyers will prep him with answers, but if he goes off-track, as he often does, he could put both feet in his mouth in minutes. His legal team knows he can't remember all the lies he's told people. After a lifetime of lying, he's been monitored telling five-a-day since he crept into office behind Putin's bare back. 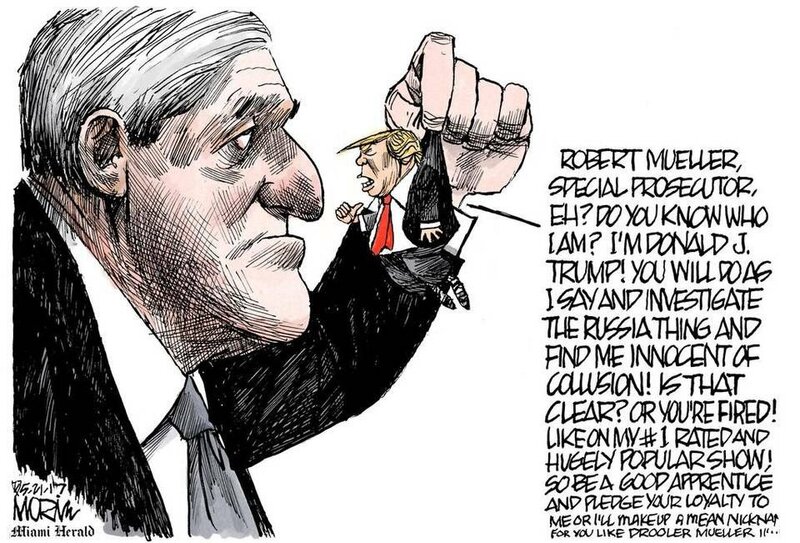 Because Trump can no longer separate reality from his own alternative universe, Mueller will be able to read his responses in real time...a chilling thought for his legal team. Kinda like Trump's hands, and his IQ.